The Saudi-American war against Yemen, led by a coalition of the richest Gulf monarchies (Saudi Arabia, Qatar, UAE, Bahrain, Kuwait, etc. along with their servants like Egypt and Morocco) against the poorest Arab country, enters its fourth month. According to the United Nations, it has killed ​​more than 3,100 and wounded 15,000, displaced 1 million and created 245,000 refugees, and created an unprecedented humanitarian crisis which the United Nations has declared to be on the level of maximum humanitarian alert. Ruthless and indiscriminate strikes target all civilian infrastructure, up to residential areas, markets, granaries, water tanks, hospitals, schools, mosques, and even archaeological remains and tombs – which recalls that the destructive ideology of the Islamic State takes its roots in Saudi Arabia – without sparing civilian convoys fleeing violence. 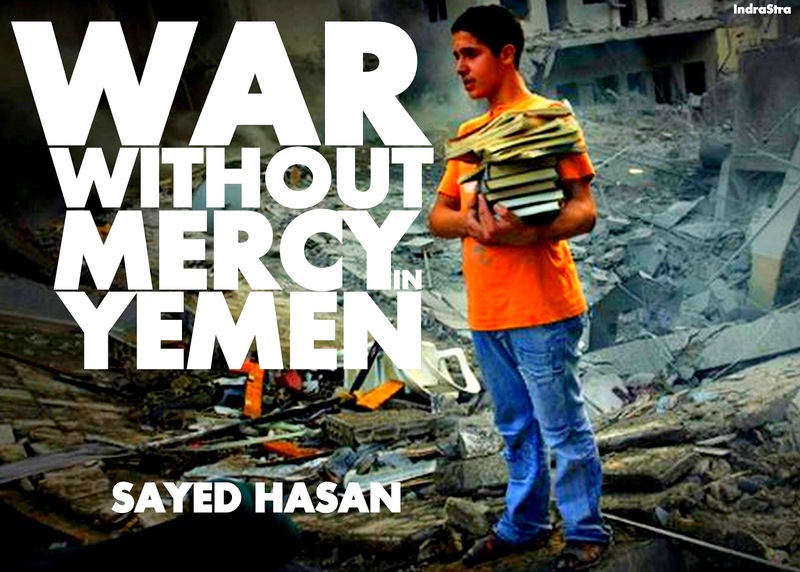 A merciless siege has been imposed in Yemen, a country which imports 90% of its food, and Relief Organizations are prevented from delivering supplies to the country, and even see their workers targeted while providing humanitarian assistance. More than 21 million people (80% of Yemen’s population) are without adequate access to staples and essential services such as food, clean water, medical care, electricity and fuel. Already, it appears that Saudi Arabia has used unconventional weapons (cluster munitions, and perhaps even chemical weapons) and has committed war crimes and perhaps even crimes against humanity. However, this war remains largely ignored by the mainstream media, both in the West and in the Arab-Muslim world (with the exception of Iran and the media close to Hezbollah in Lebanon). The US sponsors this illegal and criminal military intervention that they provide full support for, putting all their resources at the service of the Gulf monarchies who have acquired the most modern weapons to the tune of $115 billion for the single year 2014: they can therefore destabilize the region without sending their armed forces, conforming to the Obama no-boots-on-the-ground doctrine that favors proxy wars. It is the same for the other NATO member countries – United Kingdom, France, etc., which is not surprising coming from the supporters and apologists of terrorism in Syria. Regarding Riyadh, Wikileaks has recently unveiled the procedure of Saudi censorship of the entire Arab world, between corruption and intimidation. 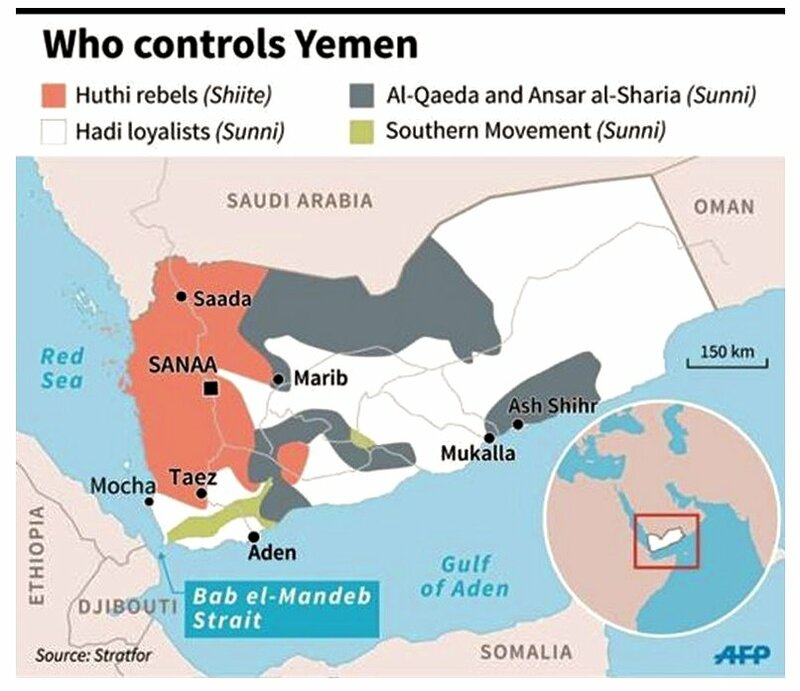 All these actors provide direct support to Al Qaeda and to the Islamic state, which has appeared on the Yemeni scene and is now on the border of Saudi Arabia, their long-time goal. The Saudi blindness seems to know no bounds. Riyadh is now in an impasse: its air campaign is a bitter failure, as was predictable given the six previous offensives since 2004 by the forces of President Saleh (yesterday supported by Saudi Arabia and now allied with the Houthi rebels), which all ended up in a failure, as well as the Israeli experiences in Lebanon and Gaza, which constitutes the perfect model of the Saudi aggression. As for the option of a ground operation, all data indicates that it would be absolutely disastrous and would end with a rout of Saudi forces. But there is no question for the House of Saud, blinded beyond any possible return, of accepting a cease-fire that would be a victory for Yemen; rather it must continue this fanatic war of terror at all costs, by torpedoing all attempts of agreement or truce, at the risk of rushing towards the abyss. As for the forces of the Yemeni resistance, they are far from having exhausted all their possibilities, and multiply the incursions into enemy territory. 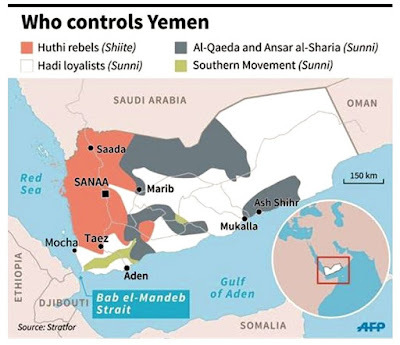 They could even question its territorial integrity by claiming Yemeni provinces formerly annexed by Saudi Arabia. And as a last resort, they could close the strategic Strait of Bab al-Mandeb – which they are quite capable of –, one of the largest global maritime passages, especially for hydrocarbons, which would have severe global repercussions. If, like Syria, Iraq and Libya, Yemen is threatened with disintegration, Saudi Arabia itself is now on the way to becoming destabilized, and even dismantling. While Pressenza does not want to prolong the agony of the Yemeni people – and the Houtis are Yemeni – by adding to the flames in any way writings such as this one here, and others of like progeny, tell of the dire situation there and are a valid though clearly one-sided view of what is taking place, but these details have to be more widely known to get a better balance in the coverage of that particular war, a war against one of the poorest nations waged by one of the richest. The language used is provocative and not what Pressenza would prefer.